One does not necessarily have to be a cat person to agree with the statement that cats are little fluffy weirdos. This is a good thing, of course, and for many people (myself included) it is a big part of their appeal. The strange behavior they exhibit on a daily basis is an almost non-stop form of entertainment, one well-worth the price of having to clean out their litter box (the only unpleasant duty regarding an otherwise hassle free animal). 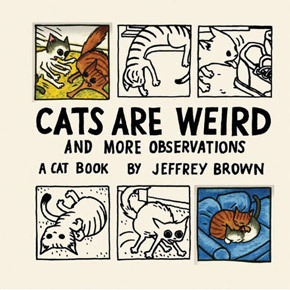 To take true note of such oddness one only needs a keen sense of observation, and Jeffrey Brown, creator of the new book Cats Are Weird and More Observations, has been noting bizarre feline idiosyncrasies for a very long time. Featured in McSweeny’s and on NPR’s This American Life, Brown is known primarily for his autobiographical graphic novels like Clumsy and Every Girl Is The End Of The World For Me, but I myself think of him just as much for his hilarious, dead-on parody of Transformers titled Incredible Change-Bots. Cats Are Weird is Brown’s second book about our little batty feline pals (the first being Cat Getting Out of a Bag) and it proves itself to be just as much of an entertaining read. I should add that “read” is a bit of a misnomer as many of these quick insights (usually a nine panel color or black & white piece covering one 6-1/2″ square page) are mostly wordless and revolve solely around an environment via a cat’s perspective, not ours. Of course, cutesy kitty cartoon books are released on a constant basis. What sets Brown’s book apart is that his intent on each page isn’t necessarily to just go for a laugh. The book has the word “observations” in the title and that’s precisely what some of the scenarios are. Some of the behaviors are funny in their own right, while others are amusing merely because they spotlight a small facet of a cat’s quirky personality that we have not seen put to paper before. This would include their propensity for giving their owners morbid “gifts” to show their love. Cats certainly do love their owners, but at times the bottled up mania that builds up in their fevered brains has to come out. Unfortunately for cat owners, that kind of pent-up, small-scale savagery can end up being directed towards them. Residing solidly in the “hey, my cat does that too!” department is the page titled Mobius Cat which highlights the rubbery, flexible lengths a feline will go through to stretch and get comfortable. The understated immediacy of Brown’s art is endearing for some and problematic for others. As a counterbalance for the cute n’ cartoony work here there are also some very nicely rendered portraits of the very cats that inspired the book itself. Another plus is the volume’s fantastic design, an element not uncommon amongst releases from publisher Chronicle Books. The line art of both the front and back cover are stamped in, while 2 of the 9 panels on the book’s front are die-cut revealing the first page inside. 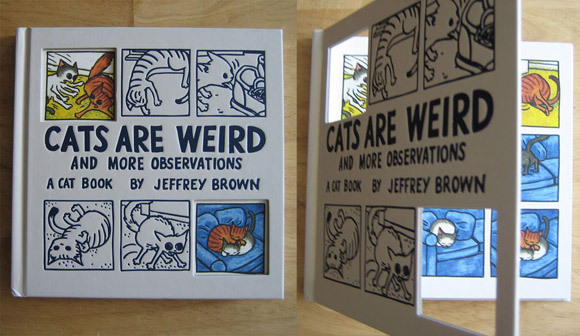 Cats Are Weird is a book that might only find fans amongst cat aficionados, while all others may be a bit confused as to why this diminutive book of observations would garner so much praise. One really needs to be a cat owner to understand the charm of watching your little furry pal create their own everyday adventures and then see such activities put so simply and succinctly in a volume like this. Jeffrey Brown has made more than just a funny animal book, this is also an homage to all cats – an homage laced with admiration and love.